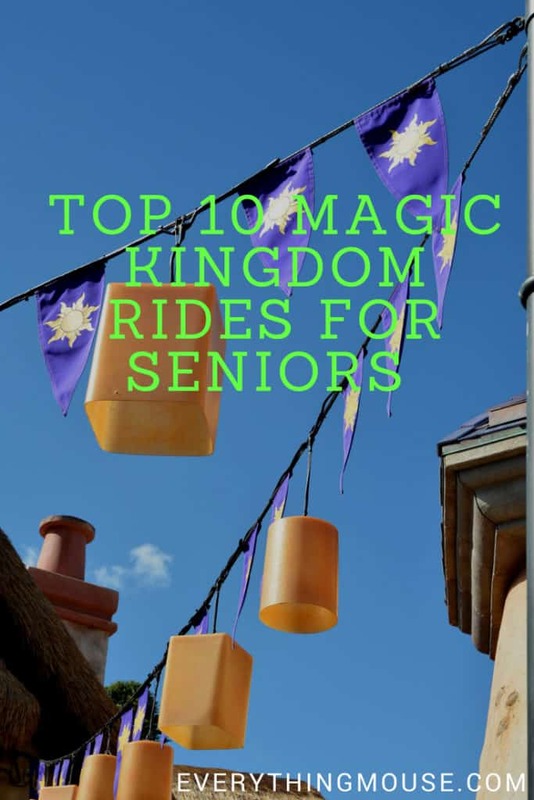 What are the Top 10 Disney Magic Kingdom rides for seniors? When we think of Disney World many think that it is a place just for children but really it is for everyone of any age. 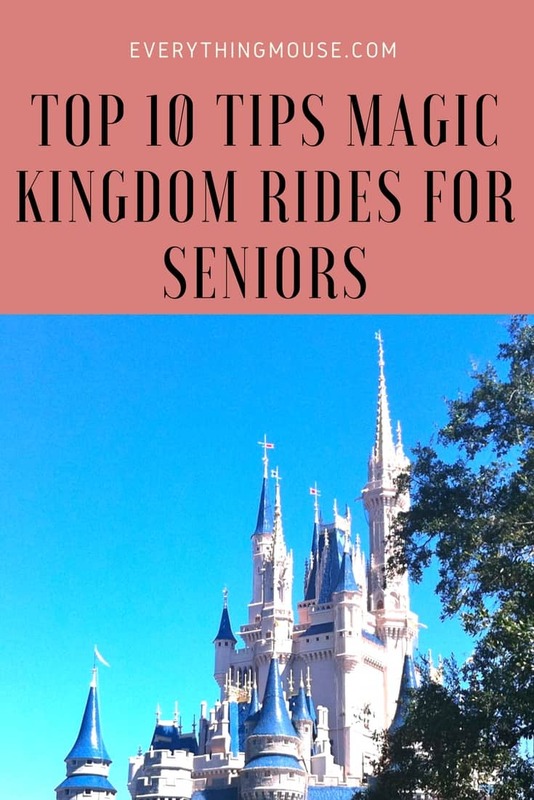 Whether you are traveling with family or making the trip to Walt Disney World by yourselves it really can be The Happiest Place on Earth for seniors too. 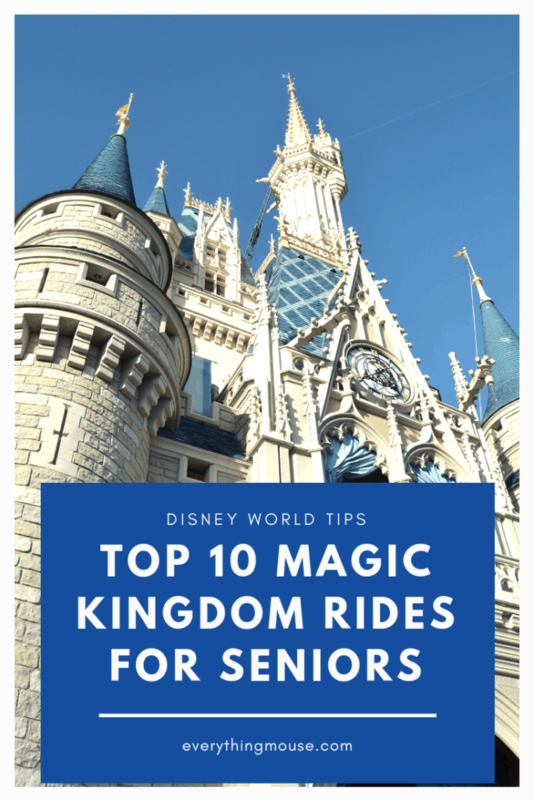 Here is a Top 10 list of attractions which may particularly appeal to seniors in Disney’s Magic Kingdom. This 10 minute Magic Kingdom Jungle Cruise boat tour is one of the original Disney World rides which opened in 1971. Guests board a boat and take a trip down The Amazon, The Congo, The Nile and The Macong River. Along the way you will encounter lots of animatronic animals including elephants, monkeys, snakes and hippos. 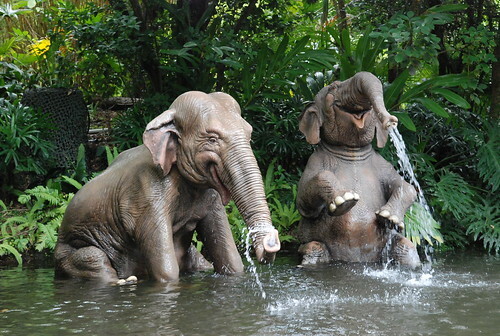 The main attraction of the Jungle Cruise is your guide. Corny jokes abound but it is all good fun for all ages. This is a Fast Pass attraction so make use of that if you can. Lines can get pretty long but they do move quickly as the boats are loaded. The line area for Jungle Cruise is under cover. However, it can get pretty hot and feel a little claustrophobic in the waiting area. Make sure you get a Fast Pass if the line is over 20 minutes. Also it can be a little difficult getting in and out of the boat. Always ask for help if you have mobility issues of any kind. The Disney Cast Members will always be happy to help you. This wonderful Peter Pan’s Flight ride will take you flying over the streets of London in a magical flying pirate ship. The theme is of course the story of Peter Pan. You will fly over scenes from the story and encounter Captain Hook , The Crocodile and Mr Smee. Peter Pan’s Flight is one of the must see rides in Walt Disney World Magic Kingdom no matter what your age. 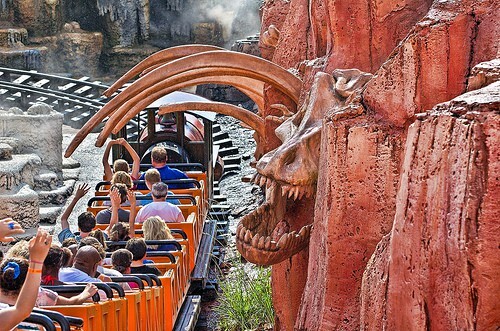 This is one of the rides which in our opinion makes Magic Kingdom truly magical. Peter Pan’s Flight is simple by the technology standards of today, That is part of it’s appeal. Peter Pan’s Flight is truly a classic Disney ride. 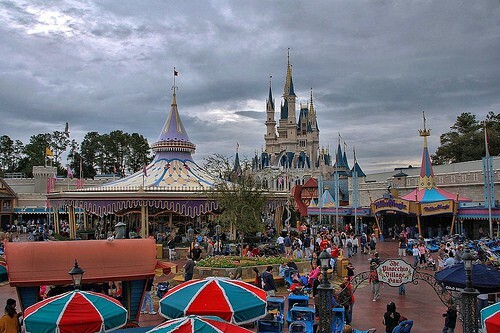 It is one of the original Walt Disney World Magic Kingdom rides which opened in 1971. 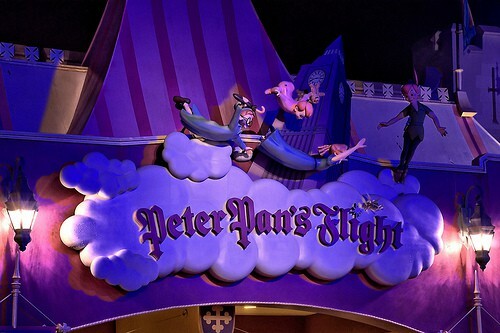 Peter Pan’s Flight is one of the most popular Magic Kingdom attractions. It also has one of the longest wait times anywhere in a Disney theme park. Make sure that you get a Fast Pass for Peter Pan. Don’t be fooled into thinking that the line is shorter than the published wait time. There is a hidden element to the line which you only discover once you have been standing in it for quite a while! You think you are almost there, but then more line appears. A Fast Pass for Peter Pan is a wise choice. Fight the evil Emperor Zurg on this fun Tomorrowland attraction. Guests board a two person space cruiser on Buzz Lightyear Space Ranger Spin to start their journey through 10 very colorful scenes. 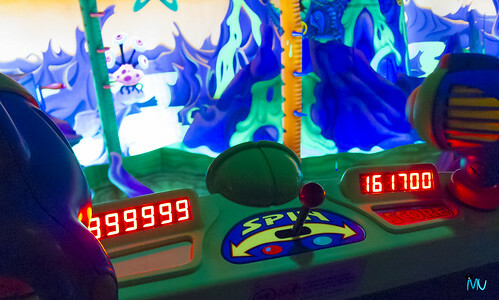 As one of Buzz Lightyear’s Junior Space Rangers you use the laser guns to shoot at the targets. When you hit one of the targets you will get points. At the end of the ride you can compare your scores on the Space Ranger board to see how you measure up to your fellow Rangers. This ride is a lot of fun and brings out the competitor in most everyone of all ages. Often you will be tempted to go back to improve your score! There are many secrets of how to get a higher score. One of the most basic ones is avoid wasting time on the circular targets as they are low scoring. If targets are lit then they have a higher than usual score. Buzz Lightyear Spacerange Spin is a Fast Pass attraction. The line does move quickly most of the time but if it is over 20 minutes get a Fast Pass. Most of the line is indoors but if it is extending outside then definitely get a Fast Pass. 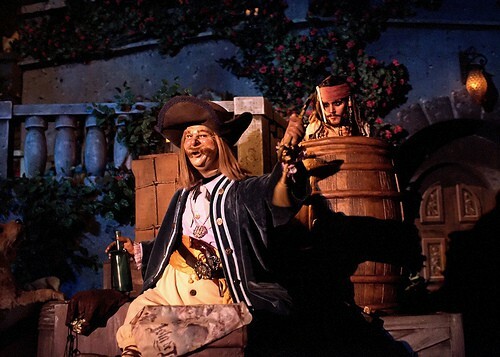 Pirates of the Caribbean is one of the original and best of all of the Disney World attractions. This should be on everyone’s must see list whatever their age. Guests board a 15 passenger boat to take an almost 9 minute water ride to encounter the Pirates of the Caribbean. There is a small drop in the dark but nothing too scary. You will glide past over 100 animatronic figures and encounter a pirate attack complete with explosions. All good fun and set to a song which will probably remain with you forever! This is one attraction which inspired a movie – rather than the usual pattern of a ride being made because of a successful movie. The ride now includes animatronic Captain Jack Sparrow figures. Apparently Johnny Depp once appeared in Disneyland Pirates of the Caribbean, so watch out and see if he ever plans to visit Florida. There isn’t a Fast Pass for this ride but lines tend to move quickly. Another great feature is that the line is completely under cover so you can escape from the Florida heat for a while. We challenge you to get the Pirates of the Caribbean ride music out of your head once you have experienced this ride! There’s A Great Big Beautiful Tomorrow. So goes the song which is sung throughout this original and very nostalgic Magic Kingdom attraction. The attraction is set in a huge revolving theater which takes you from around the beginning of the 1900s to what is meant to be the present day. There are 4 scenes which represent the different generations of one family. At the end of each scene the theater rotates and you move to the next one. This attraction is 21 minutes long and you cannot exit in the middle of the ride. If you have experienced it more than once it is also a great place to escape the heat of the day and have a nap! This is one of those thought provoking attractions which appeals to most ages. The animatronics figures tell the story of how technology has changed their lives, from the invention of electricity to the technology of the present day (well to the mid 90s anyway). This is one of those attractions that you should see at least once but probably won’t be on your list of things to do again. The lines are generally very short. A Disney classic and a must see on any visitor to Magic Kingdoms list, but this will particularly appeal to seniors. A slow moving indoor boat ride past hundreds of animatronic dolls happily singing a song about the unity of the world. 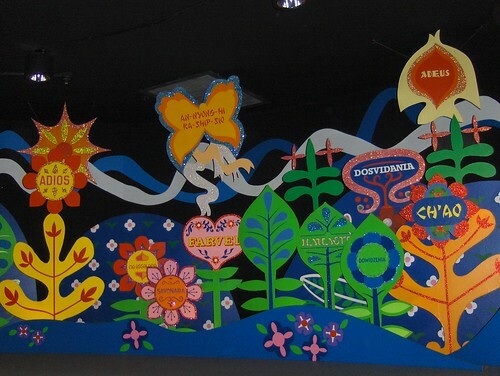 It’s A Small World was the last ride to be overseen by Walt Disney himself. The one warning is that you will probably never be able to get the song out of your head! There is no Fast Pass for It’s A Small World in Magic Kingdom. However, the lines do tend to move pretty fast as it loads continuously. If the lines are outside the building then wait until later in the day, or during a parade when lines should be shorter. 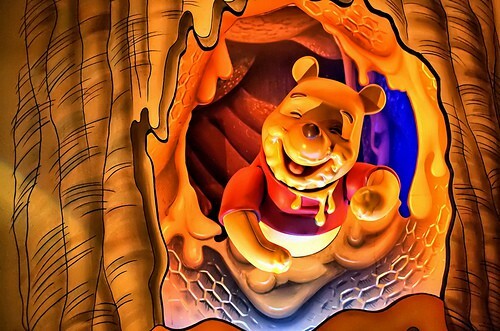 This is a gentle and colorful ride through the whimsical world of Winnie the Pooh and friends. Guests board a 4 person vehicle (or Hunny Pot) and head off on a short but sweet ride with Winnie the Pooh on his search for his pot of honey. This is another ride which is in Fantasyland in Magic Kingdom. Wait times can be long for this popular ride and the line is outside so get a Fast Pass or ride early or late in the day. Often you will get a surprise Fast Pass for Mickey’s PhilharMagic show so be sure that you stop by and watch this very entertaining attraction too. This is a great place to give you a wonderful overview of the park and have a much needed rest after walking around the Magic Kingdom! I always advise people of all ages to take a break on the Transit Authority. It is a relatively quiet and restful place to sit down for a while. So what is the Magic Kingdom Transit Authority? Walt Disney was fascinated by innovative transport systems. The Transit Authority is a 10 minute ride on a track above Tomorrowland which gives you great views of Cinderella’s Castle. It even takes you right through Space Mountain so that you can see the ride vehicles flashing by and often hear the screams of the passengers! If you want to go around again the Cast Members are usually fine with this unless there is a line. 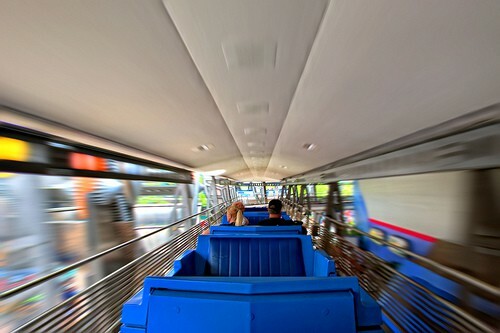 This is another one of those Magic Kingdom rides which can be great for a mid afternoon nap. 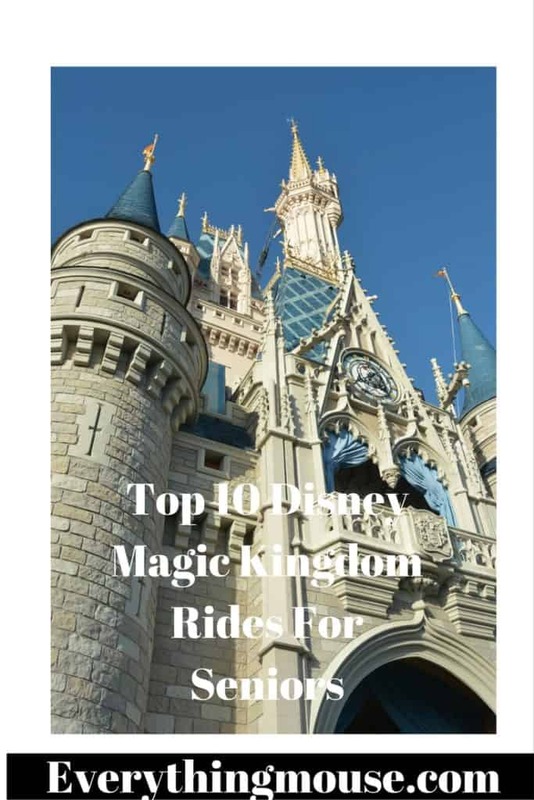 If you want more ideas about this check out our guide of Top 10 Places to Take a Nap at Walt Disney World. Wait times for Transit Authority tend to be short at most times of the day. If you see the line going to far around the bottom of the escalator, skip it until a quieter time. If you enjoy mild roller coasters then Big Thunder Mountain Railroad is a great option for seniors. It is thrilling rather than scary. However, be aware that it is bumpy with twists and turns. If you have any of the health problems listed on the warning then you should avoid the ride. 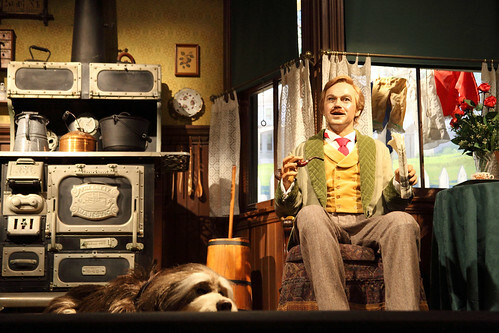 The theming on the ride is some of the best in the whole of Walt Disney World. You board a runaway mine train for a 3 and a half minute fun ride at speeds of up to 30 miles an hour. There are no big drops but there are 3 small dips and plenty of twists and turns. If you have any health concerns always heed the warnings on any Disney World ride. Always be safe. There is a Fast Pass for Big Thunder Mountain. Lines can be up to 60 minutes so make sure you ride early, late or get a Fast Pass. 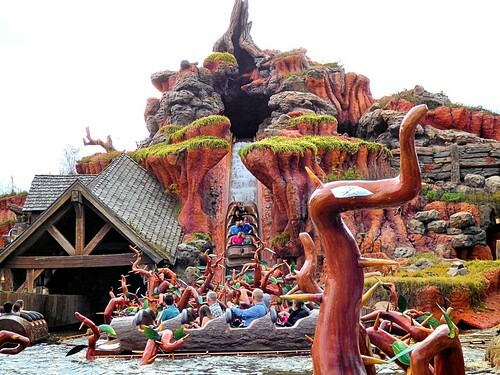 If you don’t mind getting wet then head for Splash Mountain. Take the warnings seriously. There is a serious risk you will get absolutely drenched! The ride is based on the highly contentious 1946 Disney classic movie Song of the South. Lots of cheerful animatronic characters and scenes with Brer Rabbit and Brer Fox. The tune is very catchy and you will be sure to be singing it by the end of this ride. Guests board 8 passenger logs for this 11 minute ride. There are several climbs, drops, and twists but of course the major event is the 5 story 40 mph drop. The ride is much more thrilling than scary. There is a Fast Pass for Splash Mountain. If you plan to ride both this and Big Thunder Mountain then get a Fast Pass for the one that you aren’t riding.